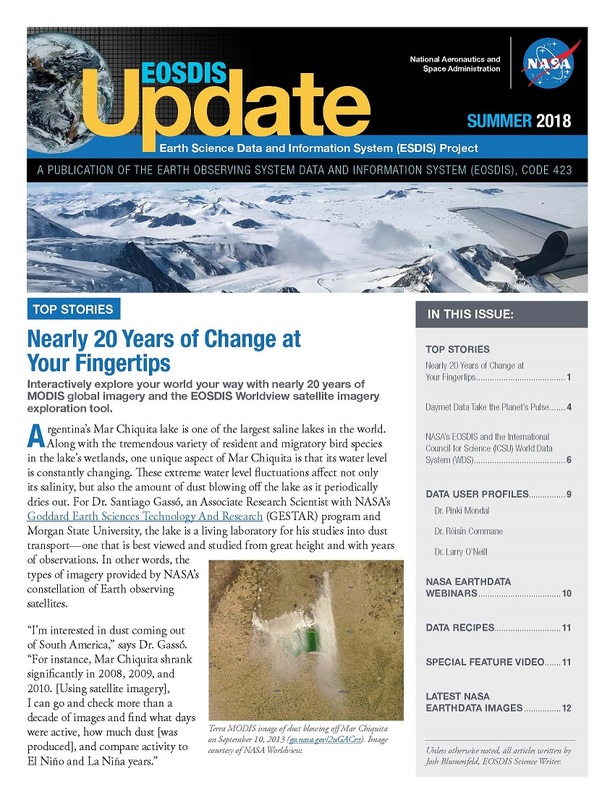 We are pleased to announce the Summer 2018 edition of the EOSDIS Update quarterly newsletter! The Summer 2018 edition of EOSDIS Update is now available! In this issue you’ll learn how to view almost 20 years of global daily MODIS imagery using NASA's Earth Observing System Data and Information System (EOSDIS) Worldview satellite imagery exploration tool (and how this monumental long-term imagery record was created). You’ll also learn more about NASA's Oak Ridge National Laboratory (ORNL) Distributed Active Archive Center (DAAC) Daymet data product, which provides gridded estimates of daily weather parameters across North America, and how EOSDIS works with the international World Data System (WDS) to help facilitate free and open data. As always, you’ll find links to Data User Profiles, webinars, data recipes and, of course, amazing images of Earth.